My 20th published book, "Technicolor Dreams" is now available in Kindle and paperback. 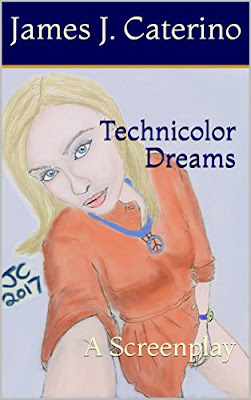 Written in the screenplay format, "Technicolor Dreams" is a rousing, time-travel romantic thriller, jam-packed with every imaginable delight you would want in a great time-travel story. Below is the back cover copy and a new review posted by a reader at Goodreads. Brimming with suspense, heart, and humor, “Technicolor Dreams” is a delightful, entertaining, time travel romantic thriller from the acclaimed and wildly controversial author James J. Caterino, the visionary imagination behind the “Caitlin Star” series, “Steel Phantom”, The Last Neanderthal”, and “Among the Stars”. Customer review from Richie at Goodreads (posted with his permission). "A wildly imaginative (and very well thought out) time travel story written in the screenplay format that plays as both a serial killer thriller and a very engaging romance. One of the main characters (recently retired stuntman James Bava who travels back to 1969 to save the woman who once saved him as a small child) states that "Back to the Future" is his favorite film and one can definitely see that influence, as well as the 1980 movie "Somewhere in Time" and the Richard Matheson novel it is based on. As a matter of fact, the character in this story that invents time travel is named Troy Matheson, not a coincidence I imagine. This story has a clean time loop based on solid (if speculative) science, very strong characters, great dialogue, suspense, romance, and even wonderful humor. Mr. Caterino's "Technicolor Dreams" would make for a sensational movie and this book is very entertaining."